2019 1 oz. gold Philharmonic coins are one of the most popular gold bullion products. The outstanding beauty and the rich legacy of the long-running Vienna Philharmonic gold coin series appeal to investors around the world. Austrian Philharmonic gold coins belong in the portfolio of any precious metals investor who appreciates fine art and who wants to diversify his or her holdings with a variety of widely trusted, instantly recognizable world bullion coins. Virtually Pure Gold Content – 1 ounce gold Philharmonics contain nearly 99.99% pure gold, meaning it’s four 9s fine! Gold Philharmonics Are IRA Eligible – You can enjoy potential tax benefits when you add gold Philharmonics to your individual retirement account. 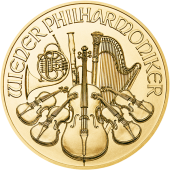 Government Guaranteed – Philharmonic gold coins are backed by Austria’s government. Easily Liquid – Philharmonic coins are in high demand and widely traded around the world. Wealth You Can Hold – Vienna Philharmonic gold coins are a reliable hedge against inflation and represent real wealth you can hold in your hands and pass on to the next generation. There’s a reason bullion investors and gold stackers need to worry about the surface quality and eye appeal of their coins. Damaged gold coins are not only harder to liquidate than those with clean surfaces, but gold coins with heavy nicks and scratches may also contain less gold than stated on the coin. As any gold investor will tell you, every gram counts. Why pay for ugly gold coins when you can buy the best at Universal Coin & Bullion? Here, the word “quality” isn’t just an advertising gimmick but a real promise guaranteed by Dr. Michael Fuljenz – “America’s Gold Expert” himself. We are honored that Dr. Fuljenz, a longtime bullion professional who has appeared on Fox Business News, Bloomberg TV, and CNBC evaluates the coins that come into our inventory. Few Philharmonic 1 oz. gold coins meet the criteria that Dr. Fuljenz and his team of gold experts allow into the inventory at Universal Coin & Bullion. You can be confident that every coin you buy from us is of the highest quality. It’s a promise we stand behind with our 100% satisfaction guarantee. Our customer care associates are standing by to assist you with your order and answer any questions you may have. What’s more, we offer free shipping on all online orders over $99, which means buying from us can help you maximize your investment dollars. Don’t worry – every order is shipped in secure, discreet packaging to help ensure your order arrives safely. It’s no wonder we’ve earned and proudly maintain an A+ rating with the Better Business Bureau. Gold prices are always on the move. Call Universal Coin & Bullion today toll-free at 800.822.4653 to buy your 2019 1 oz. gold Vienna Philharmonic coins today before prices go up. The 2019 1 oz. Gold Philharmonic coins are just the latest entries in the time-honored gold bullion series that the Austrian Mint introduced in October 1989. Vienna Philharmonic 1 ounce gold coins carried a denomination of 2,000 schilling until the debut of the euro in 2002. Today, 1 oz. Philharmonic gold coins are denominated as 100 euros. True to the coin’s moniker, “Philharmonic,” this gold coin’s internationally recognized design incorporates a variety of musical instruments seen and heard in Austria’s famous Vienna Philharmonic Orchestra. On the obverse of the coin is the Great Organ of the Golden Hall that proudly resides in Vienna’s concert hall known as the Musikverein. The reverse carries a variety of other instruments, including the Vienna horn, cello, harp, bassoon, and harp.